The Clean Water Program (CWP) will provide a general program presentation to the Sustainability Commission at its November 9 meeting. The presentation will also include an update about how the program is incorporating sustainability efforts in the following areas: the City’s Climate Action Plan, Leadership in Energy and Environmental Design (LEED) Certification, Envision system metrics, and progress on recycled water study and water reuse options. 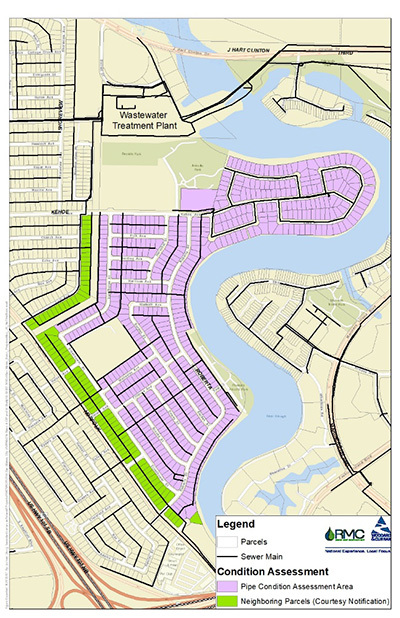 The Clean Water Program will hold a third informational meeting on November 16 about upcoming condition assessments of the sewer system in the Marina Lagoon and the southern portion of the Shoreview Parkside neighborhoods (see map area below). The meeting will present the same information that was given at earlier neighborhood meetings on October 12 and October 17. The added meeting will be November 16, 7:00-8:30 p.m. at Parkside Elementary School. The condition assessment work is planned for November 2017 through March 2018, and will include a variety of inspections and tests to determine how best to fix aging or damaged lines. For some of these condition assessments, the City must obtain homeowners’ permission for workers to enter the property. At the neighborhood meeting, residents will be able to determine the specific activities that may be planned for their property, and if a Right-of-Entry form is required. Residents will also have the opportunity to fill out Right-of-Entry forms at the neighborhood meeting. The meeting will start promptly at 7:00 p.m. with a formal presentation and time for questions, followed by an open house with information stations. The meeting will provide details about the locations and types of work that will be focused on sewer lines, sewer manholes, and storm drain lines. General information about the Clean Water Program will also be presented. These condition assessments are a vital element of the Clean Water Program, which is upgrading and repairing the City’s aging sewer collection and treatment system. As part of this program, several sewer projects are planned to improve service and comply with regulatory requirements to protect public health and the environment for years to come. If you live in the project area and received a right-of-entry form from us, we encourage you to sign and return it to us at the earliest opportunity so that this important work to improve the community can move forward. If you have questions about the right-of-entry form, please call 650.727.6870. For more information, please visit the project web page here. San Mateo residents are invited to attend either of two community meetings to learn about the Clean Water Program being implemented by the City of San Mateo Public Works Department. This multi-year capital improvement program will upgrade our sanitary sewer system and improve the wastewater treatment plant to prevent pollution, comply with regulations, improve service, and protect the environment and public health. These meetings will provide information about proposed sewer rate restructuring and increases that are needed to help fund these necessary improvements in our city’s vital infrastructure. The same information will be presented at both meetings. For more information, visit www.CleanWaterProgramSanMateo.org, or call 650.727.6870. Wednesday, November 29, 6:30 – 8:30 p.m.
Thursday, November 30, 6:30 – 8:30 p.m.